Mary Helen Barcellos-Hoff is a cell biologist who does cancer research with Berkeley Lab’s Life Sciences Division. Her field of expertise is the effect of ionizing radiation on tissue. 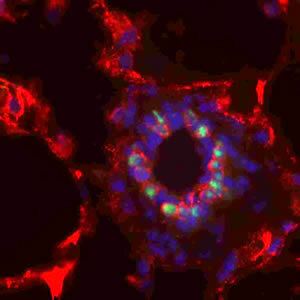 Unlike most cancer researchers who ask the question, "How do cells become cancerous?" Barcellos-Hoff poses the question, "How do tissues become tumors?" 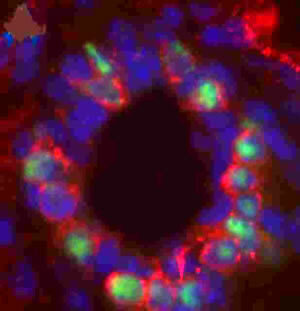 In this image of mouse mammary tissue (top), the nuclei of breast cells are shown in blue, red shows areas of active TGF-beta proteins, which inhibits mammary cell proliferation, and green marks the site of progesterone receptors which are critical to normal mammary tissue development. The research of Mary Helen Barcellos-Hoff has focused on tissue response to ionizing radiation and how exposure can lead to cancer through the disruption of communications between cell nuclei and their environment. Bottom image: area enlargement. Ionizing radiation is a well-established carcinogen but studies of its cancer-causing effects have largely concentrated on genetic damage to cells. Barcellos-Hoff shifted her focus onto tissue perhaps because her unusual academic background gave her a fresh perspective on cancer research. Barcellos-Hoff earned her undergraduate degree from the University of Chicago in biopsychology, a field of research in which human behavior is studied as the product of interactions between the brain, the body, and the environment. Her Ph.D. was in experimental pathology from the University of California at San Francisco where she still holds an appointment in their Anatomy Department. She came to Berkeley Lab in 1986 to do postdoctoral research in cell biology under Mina Bissell, the first scientist to link breast cancer to the “extracellular matrix” or ECM, a support network of proteins surrounding breast cells. Barcellos-Hoff began studying what happens to the ECM after it has been exposed to low doses of ionizing radiation. Her experiments showed that proper communications between a cell and its ECM are crucial to normal functioning. A breakdown in these communications can initiate the cancer process or cause an abnormally high rate of apoptosis -- programmed cell death -- another significant factor in the development of breast and other cancers. The ECM has been programmed to send signals to the cells that would suppress genomic mutations and cell apoptosis. However, as exposure to low doses of ionizing radiation intensifies, this defense program becomes corrupted and the wrong signals get transmitted. “Under certain conditions, radiation exposure prevents normal cell interactions, which in turn predisposes susceptible cells to genomic instability that can result in mutations and apoptosis,” Barcellos-Hoff says. NASA recently awarded Barcellos-Hoff a $10 million grant for a five-year study of the cancer risks posed to astronauts by radiation in space that our atmosphere normally shields us from.